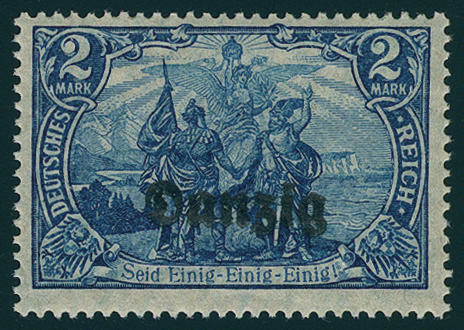 5867 33A 20 Gr. 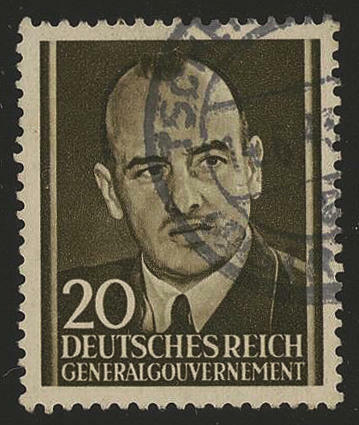 Frank 1943, British Propaganda forgery for the Generalgouvernement, fresh colors from lower margin, at the bottom on the right three perforation shortened, otherwise in perfect condition mint never hinged, a scarce and sought issue. Photo expertize Pieles BPP. 5868 ⊙ 33A 20 Gr. Frank 1943, British counterfeit for the Generalgouvernement, fresh colors and neat cancelled \"Czestochowa 14.6.43. 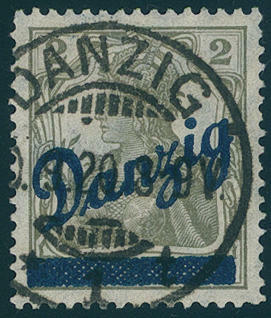 \", genuine and used in the correct time before the stamps were demonetized. 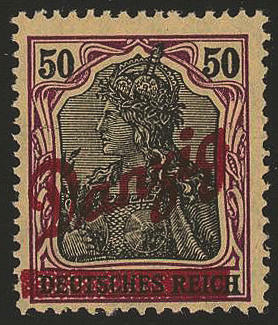 Especially in used condition an extraordinarily scarce and sought issue. Photo expertize \"genuine and immaculate\" Paetow BPP. 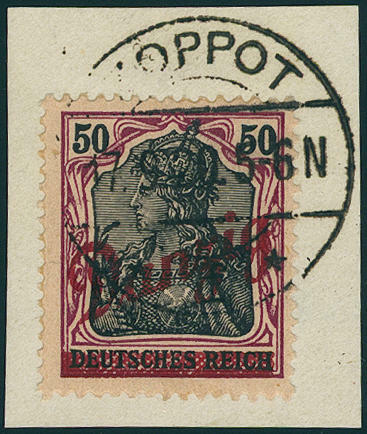 5869 36/46 British forgeries for the from Germany occupied France, all values the issues Merkur head / iris and Petain, in total 11 values, fresh colors and very well perforated, in perfect condition mint never hinged also the extremely rare 1, 50 Fr. 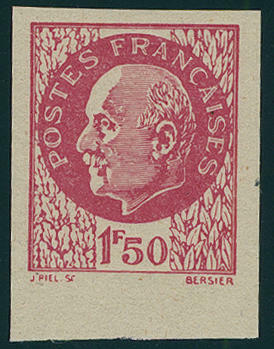 Petain in red carmine, the only in few copies have become known is. Another set hereof obtained in of our 94. Auction a surtax from 2200,- €. Photo expertize \"the quality is perfect\" Pieles BPP. 5870 44B 1, 50 Fr. 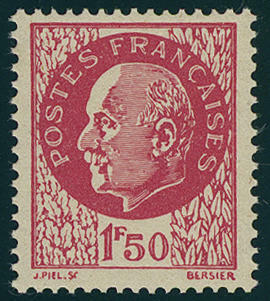 Rose-carmine, marshal Pétain, four sides with wide margins unperforated, fresh colors and in perfect condition mint never hinged, without any signs. These stamp is already perforated extraordinarily rare. 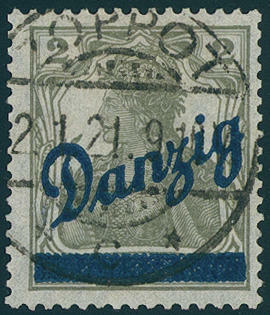 In unperforated form are only a few copies became known. These are among the great rarities of this area. In the Michel special catalogue due to missing offers only noted without price! Photo expertize \"the quality is perfect\" Pieles BPP. 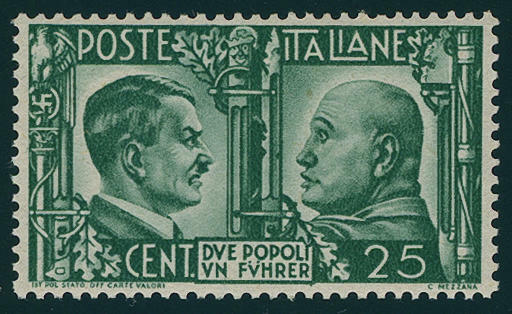 5871 49 25 C. Hitler and Mussolini, British counterfeit for Italy, an ally of Germany, wonderful fresh colors and very well perforated, in perfect condition mint never hinged, without any signs. An extremely scarce, hardly once offered issue! Photo expertize \"the quality is perfect\" Pieles BPP. 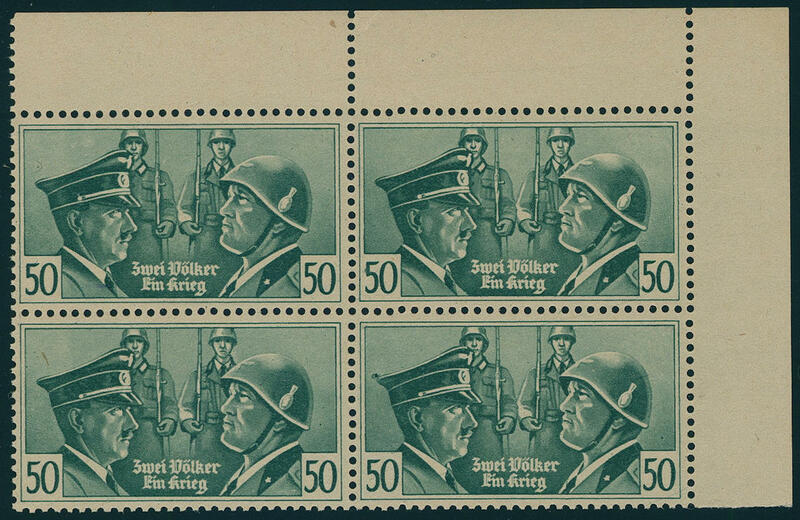 5872 50 50 C. Hitler and Mussolini 1943, British Propaganda forgery for Italy, an ally of Germany, dreamlike nice block of four from of the right upper corner of the sheet, fresh colors and very well perforated, unfolded, in perfect condition mint never hinged, without any signs. An outstanding quality of this rare unit for the highest standards! Photo expertize \"the quality is perfect\" Pieles BPP. Michel 5200,- €. 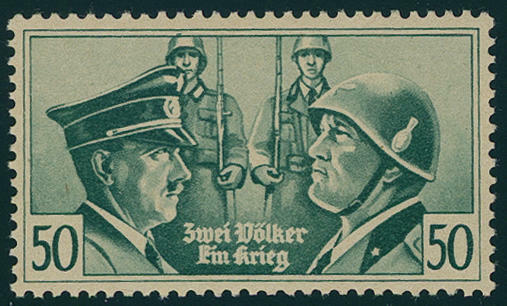 5873 50 50 C. Hitler and Mussolini, British counterfeit for Italy, an ally of Germany, fresh colors and very well perforated, in perfect condition mint never hinged, without any signs. A scarce issue! Photo expertize \"the quality is perfect\" Pieles BPP. 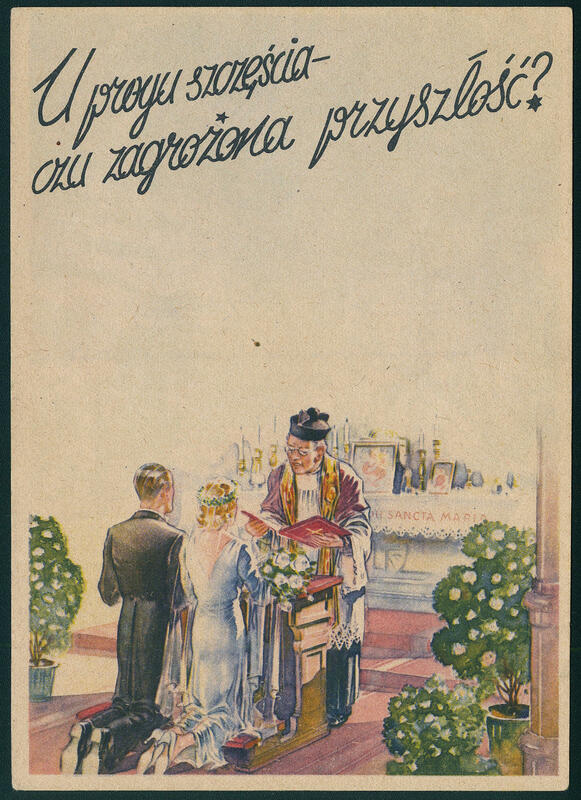 5878 ✉ \"bridal couple genuflects before cleric\", spectacular draft one German war propaganda card for Poland with inscription \"U PROGU SZCZESCIA-CZU ZAGROZONA PRZYSZLOSC\" (translated: start of the success or forbidden future? With background scene \"a Russian serviceman raped a bride\". These propaganda card \"Stop against the light\" counts to the large rarities of this area. There are very few examples have become known. 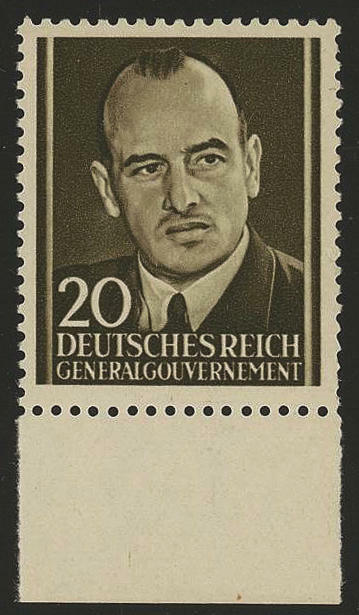 Depicted and described in the book \"black post, volume 2, page 580-581\" from Wolfgang Baldus. Photo expertize \"excellent condition\" Pieles. 5378 ⊙ 16Y 80 Pfg. 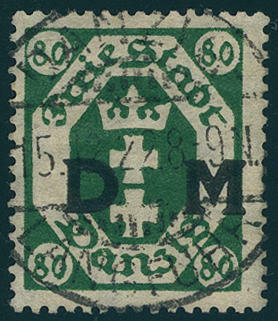 National coat of arms with overprint \"DM\" and very scarce \"lying in lieu of vertical watermark\", fresh colors and very well perforated, especially nice centric, date-appropriate and neat cancelled \"Gdansk LANGFUHR 15.12.22. \". There are only few on self-formed pages examples from this known. In this outstanding quality exception quality a piece of dream for the highest standards! Photo expertize \"genuine and immaculate\" Gruber BPP. 5379 ⊙ 16Y 200 Pfg. 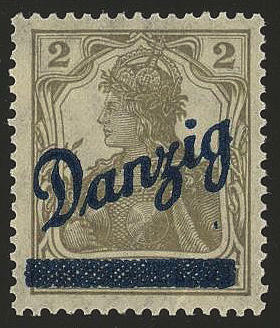 Dark purple, wonderful fresh colors and very well perforated, clean on self-formed pages \"Gdansk 15.3.23. \". Genuine used an extremely rare issue! Photo expertize \"genuine and immaculate\" Soecknick BPP. 5380 ✉ Prussia, 3 Sgr. 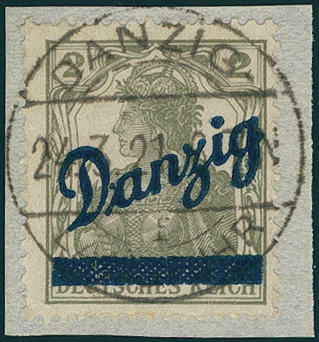 Coat of arms, postal stationery cover with clear rectangle cancel \"Gdansk 20.9. 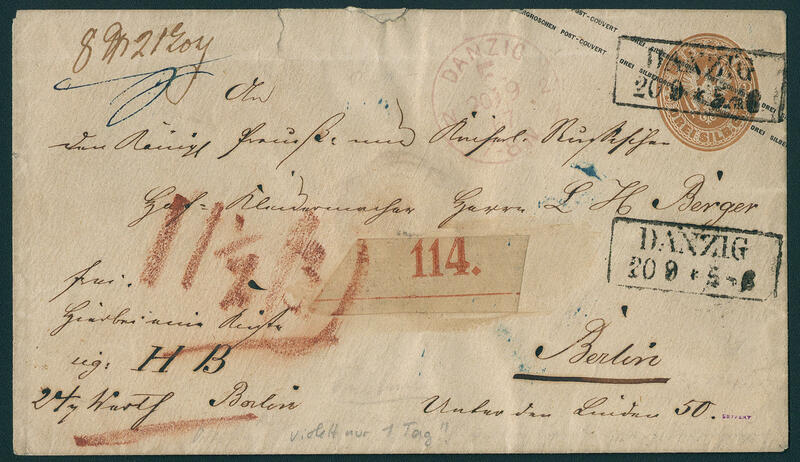 (1867) \" with violet additional single circle postmark \"Gdansk F 20.9.67\" to Berlin with arrival postmark. 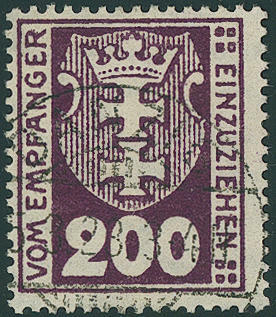 An extraordinarily scarce part-cash-postage, especially in combination with the violet stamp pad ink, the only a day in use been be should. 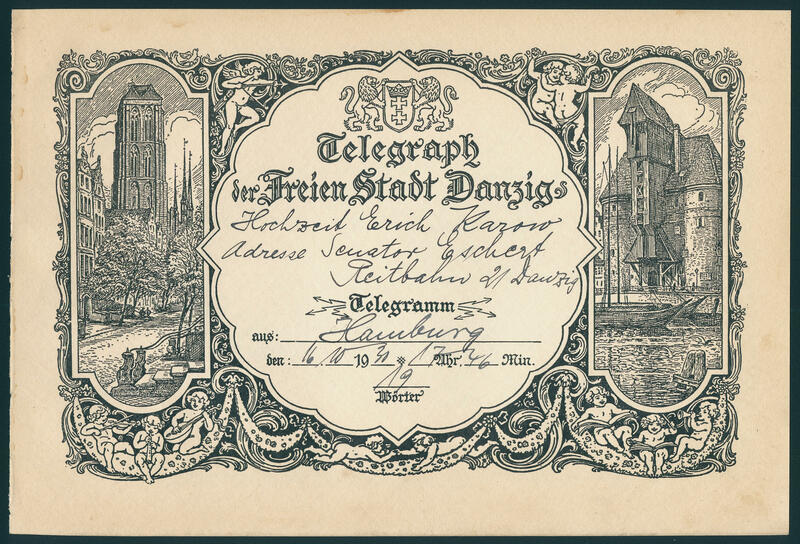 5381 telegram Decorative sheet telegram the free city of Danzig, clean used, a few tiny spot are undisturbing, to the wedding from Erich Karow, address senator Eschert in Gdansk. Rare! 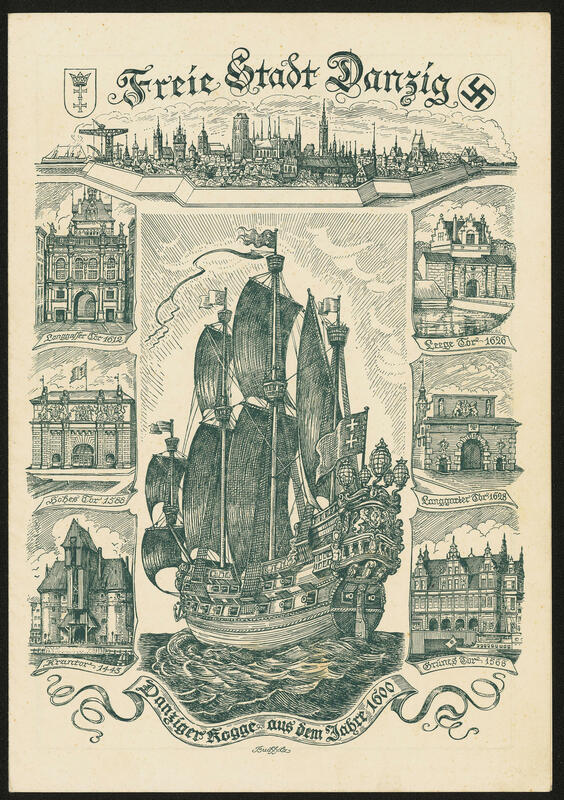 5382 telegram Free city Gdansk, Danziger cog from the year 1600, rare decorative sheet telegram from 1939 clean commercially used in above average good condition with Congratulations to one wedding in Gdansk. 5359 11aDD 2 Mk. 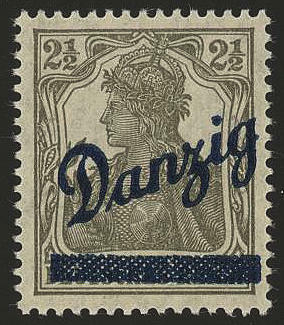 Dark cobalt with double overprint \"Gdansk\", fresh colors and very well perforated, in perfect condition mint never hinged the first overprint appeared because of the to small application of paint in gray black colour and was therefore within a second printing cycle reinforces. 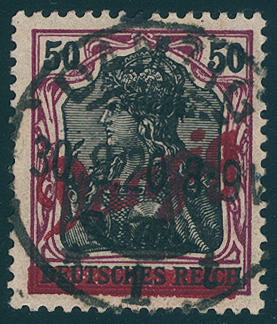 A very scarce variety in perfect condition. Photo expertize \"perfectly quality\" Dr. Oechsner BPP. 5360 29II 3 Mk. On 7 ½ Pfg. With gray green background, tips downward, block of four, in perfect condition mint never hinged, photo expertize \"genuine and immaculate\" Soecknick BPP. Michel 600,- €. 5361 ⊙ 32 2 Pfg. Small indoor service, fresh colors, clean centric and on self-formed pages \"Sopot 2.1.21. \". Photo expertize \"genuine and immaculate\" Soecknick BPP. 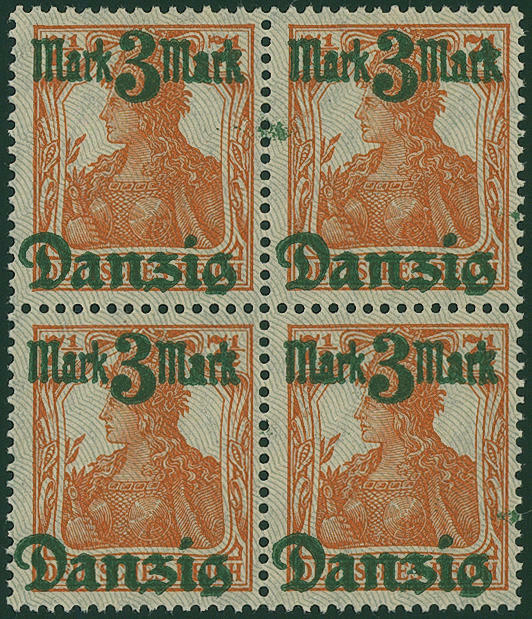 5362 32/40 Small indoor service 1920, all nine values fresh colors and very well perforated, in perfect condition mint never hinged perfectly mint never hinged sets of this issue are offered infrequently! Photo expertize \"genuine and IN perfect quality\" Gruber BPP. 5363 ⊙ 32/40 Small indoor service 1920, all nine values, fresh colors in faultless quality, clean and date-appropriate, mostly centric cancellation \"Gdansk\". 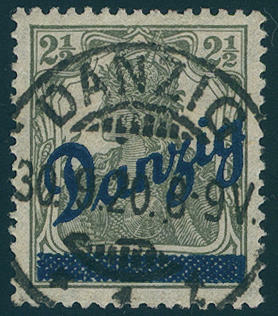 In this quality a very scarce issue! Photo expertize \"genuine and immaculate\" Gruber BPP. 5364 ⊙ 32/40 Small indoor service 1920, all nine values, fresh colors and very well perforated, with clean CTO in perfect condition, as well 2 Pfg. And 50 Pfg. On beautiful letter pieces, expertized Hochkeppeler respectively Kniep BPP. 5365 ⊙ 43III 2 M. On 35 Pfg. 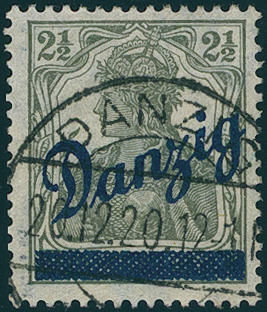 Without burelage, fresh colors and very well perforated, especially nice clear and on self-formed pages \"Sopot 19.10.20. \". 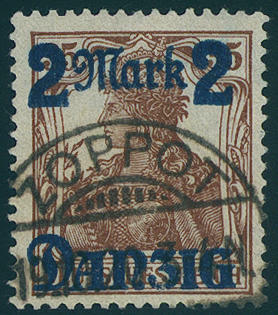 A wonderful copy this Gdansk rarity! Photo expertize \"genuine and immaculate\" Soecknick BPP.